Writers! Need chocolate in a hurry to fuel those writing sprints or to reward yourself for meeting a goal? 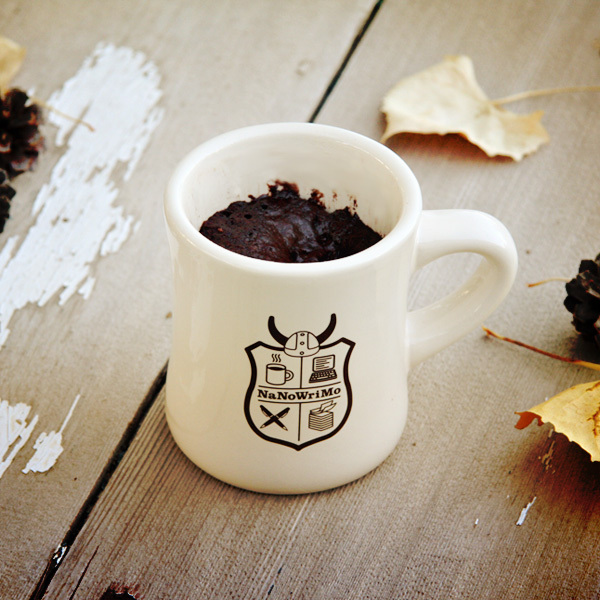 This blissful cup of brownie goodness is sure to hit the spot. Stir together until well blended. Microwave on HIGH for one minute. Microwaves vary! Check every 30 seconds. When done it will be springy but gooey on top. Speaking of National Novel Writing Month (NaNoWriMo), it’s coming right up! Only nineteen days! Are you excited? I am. I’d be even more excited if I knew what I was going to write. It’s time now to be plotting and outlining, but I’m working feverishly to finish up a few other projects. I do know that I’ll be tackling one of Sherakai’s stories, but I’m not yet sure which. AAAAAAAAAAAAHHHHHHHHHHHHHHHHHH not NaNoWriMo! I'm not READY! It can't be almost November yet! Do! Looking at my calendar and my current project makes me want to go make a brownie right now. I'm running out of days!